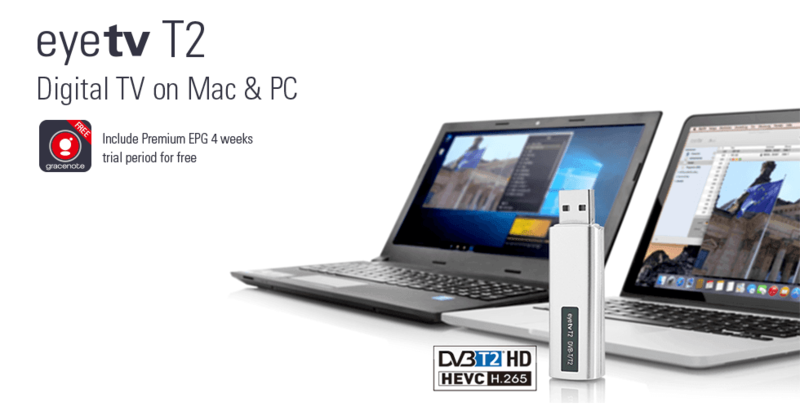 Watch, record, edit, and enjoy TV on a Mac or PC with eyetv T2 hybrid. Superbly engineered and versatile, eyetv T2 hybrid delivers free-to-view digital television to your Mac or PC via aerial (DVB-T/ T2/ T2 HD) and cable (DVB-C). Despite its small size, eyetv T2 hybrid contains a full-size and built-in coaxial plug and does not require an adapter to connect an aerial. Simply connect eyetv T2 hybrid to your TV aerial to receive the great variety of free-to-view TV programs that are broadcast over-the-air. eyetv T2 hybrid records digital HD TV in one quality setting, lossless. The digital stream is recorded unaltered for full quality digital content as encoded by the broadcaster. eyetv T2 hybrid also supports multilingual programming and Dolby® Digital sound. With eyetv Version 3.6.9 in combination with the eyetv T2 hybrid you can now receive digital DVB-T/T2 television using an aerial. With the television app for Mac OSX, you are ready to receive European MPEG-4-based DVB-T2 programs (France, Great Britain, Italy, Poland, etc.) and perfectly prepared for DVB-T2 HEVC TV reception in Germany. DVB-T2 is the second generation of digital terrestrial television. You can use eyetv T2 hybrid with a Mac or PC. eyetv T2 hybrid is compatible with Windows 8 or later and includes THC software for Windows, which supports many of the same features as eyetv 3. With the latest Version of the Total TV Player and the eyetv T2 hybrid, you can now receive digital DVB-T/T2 television using an aerial. With the television app for Windows, you are ready to receive European MPEG-4-based DVB-T2 programmes (France, Great Britain, Italy, Poland, etc. based on standard) and perfectly prepared for DVB-T2 HEVC TV reception in Germany. DVB-T2 is the second generation of digital terrestrial television. In fact, the decoding of the high-resolution DVB-T2 HD transmission signal and the synchronization with the sound signal stimulate the interplay of the receiver and the computer more than we and many users have already successfully tested in the pilot operations. Only if the components are coordinated and the resources are distributed effectively, the results can meet all expectations. Otherwise, there will be stuttering and shifts in the reproduction of image and sound. Very important: In order to create the prerequisites for interference-free reception of DVB-T2 HD HEVC/h.265 (1080p/50), all system requirements must be fulfilled. Internet connection required to download eyetv 3 / Total TV Player. as well as at least 4 GB of RAM(random access memory) and macOS 10.9 or newer. Encrypted programs are not supported. DVB-T2 h.264 broadcasted in Austria is not supported. Digital terrestrial television is also known as DVB-T, DTT, Freeview in the UK, and TNT in France. DVB-T reception can vary by location, and a rooftop aerial may be required in areas with a weak or obstructed DVB-T signal. *With the eyetv T2 hybrid, you can, as of July, receive 2016 DVB-T/DVB-T2 and DVB-T2 HEVC television via aerial on a future-proof basis. eyetv T2 hybrid receives MPEG-4-based DVB-T2 programs broadcast on an international basis, including in France, Great Britain, Italy, Poland, etc..